Palazzo Sant Ursula is a converted 16-century, spacious and quiet Valletta palace close to Grand Harbour. The house has original features and a roof garden which is a treat on sunny days all year round and warm summer evenings. Wifi internet and breakfast are included in the price. We have 4 bedrooms available, 2 rooms with private bathroom. We have 2 similar suites with private bathroom, one has 2 twin beds on the first floor & the other has a double bed on the third floor. They are booked according to availability so you may have a room with twin beds or a room with a double bed when booking the Hastings Suites. We are located in a good residential area but still provide a quite ambience. Easy access to other parts of Malta from the bus terminus and ferries, where route buses to all locations on the island leave frequently. Just minutes walk from shops, restaurants and coffee shops, Britannia College/ bus terminus is 5 minutes away. Advise us about arrival time of check in, this is very important. We will send you an official email with information about the Palazzo, so please reply to that email with your check in time. Always include your mobile number that you will be using while in Malta so that we can contact you if needs be. Check out time is usually after breakfast but we are flexible depending on our other bookings. Malta is pretty hot all year round, we provide fans in summer but for winter days the palazzo has no heating in rooms. A portable heater is available in winter days at a one time fee. We have a shared refrigerator on the roof, in which you can store your own drinks/food to enjoy in your room or on our lovely roof garden. In the roof we also have a microwave oven & a kettle for the use of all guests. An eco-tax of 50c per person (over 18 years) per night up to a maximun of €5 per person per stay is to be paid on check-in and added to the total remaining amount due. An amazing hostel, really nice and clean, and with really friendly and helpful people working there. The best hostel I have been so far after many years of travelling around. Great place to stay in the very heart of Valetta. It is a very old palazzo with the corresponding ambiance, but with modern facilities (wifi works very well), very nice and hepful welcome. If you need air conditioning or high standard of comfort, it may not be convenient. Otherwise it is very much worth staying there to discover Valetta. Le palazzo est très bien placé dans La Valette. Jessica est très disponible autant avant notre séjour que pendant.. nous avons pris la chambre de deux avec salle de bain , et nous ne regrettons pas ! Je reviendrais à Malte c’est certain et je m arrêterais pour sûr au palazzo. Merci à vous ! Merveilleux Palazzo à la maltaise vieux de 500 ans. Un retour dans le passé aux temps des Grands Maîtres et aux chevaliers de l'Ordre. Ici vous pouvez arborer fièrement votre croix ! Le style bien que rococo est dans le thème et se fond parfaitement dans le paysage pittoresque de La Valette. Grâce à son rooftop, vous pouvez siroter une bière à la belle étoile ou plus si affinité avec votre chère et tendre. Merveilleuse expérience. 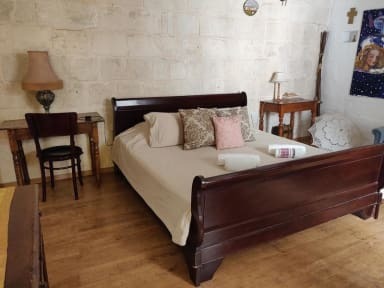 The room is very well situated to visit Valletta in a quiet street and a charming Palazio. Good bedding. I particurlarly appreciated the two terraces witch offer a wonderfull view to the city. Virginia, and all personnal, was efficiente and kind. The upstairs bedrooms are more confortable and lovely, but more expensive. I surely come back to this nice place next time. Malgré la canicule, le ventilateur a permis de dormir correctement. Un frigo à disposition. Une très bonne adresse à La Valette! A cosy atmosphere in this palazzo really well situated, in a quiet street but near all the attractions and near the ferry for the Three Cities. The staff is very helpful, they booked a taxi waiting for me at the airport. The breakfast is simple but it's sufficient. The living-room and the terrace are truly enjoyable. It was a perfect stay. Localisation parfaite dans le centre de La Valette, personnel très sympa et accueillant, tarif raisonnable et immeuble de charme. Juste les lits sont à changer. Jessica et son amie sont vraiment très agréable. L’hôtel est typique, les chambres sont très sympas. Le petit déjeuner est simple mais rempli bien l’estomac. Jessica propose le service d’une navette pour 25€ , pour nous elle avait même pensé au siège auto pour bebe. Je recommande. J'ai beaucoup apprécié le côté rétro de ce lieu. Un retour dans le passé. la pièce de vie est magnifique avec peut-être ses 8 mètres sous plafond et ma chambre avec ce décor à l'ancienne, ses fenêtres style "moucharabieh" m'ont beaucoup plu. Mais j'ai conscience que malgré une salle d'eau collective j'avais très probablement la chambre la plus belle. Sinon le petit déjeuner est très copieux et nos hôtes sont très agréables. Situation dans une des rues les plus spectaculaires du centre ville. The staff is nice. The location is amazing, right next to the main street. Everything is so beautiful inside the Palazzo. And the breakfast is so great. I recommend this place.